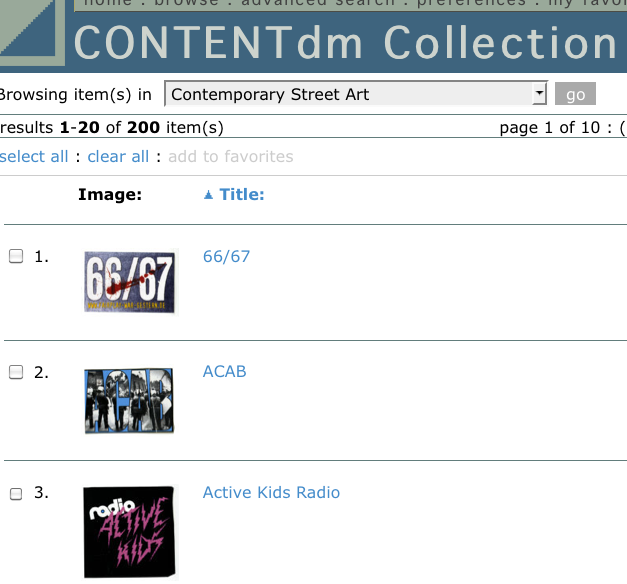 The contemporary street art database is being re-conceived in a much more useful fashion. AT SLU, arts cataloging guru Arline Wolfe has been organizing image files and assigning consistent terms for artist, title, date, location, and most importantly, subject and description fields. Good cataloging = easier and better access. Sounds simple. It’s not. Really not. We’re still stuck with a non-intuitive online display format using ContentDM software, but at some point in the future something better will surely appear on the horizon. Arline now has 200 stickers from Berlin in the new collection with 300 in the wings – another 200 from Berlin (and possibly Munich?) and 100 from NYC. Wo0T! Stay tuned!